Quakers greatly value the presence of Children and Young People in our Meetings and recognise the many gifts they bring. We seek to nurture them on their own spiritual journey within the context of a safe, caring community. 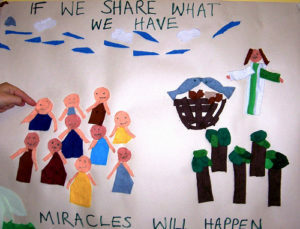 Children’s Meeting is normally held Sundays two or three times monthly at Poole Meeting House. If there is a month with a fifth Sunday, a ‘Families Together’ outing is often arranged. Children’s Meeting is 10.30 am to 11.30 am, starting with a theme and activity managed by a team of at least two adults in our well equipped Children’s Room, and finishing with shared worship in the main Meeting with the grownups. Children of all ages, including toddlers, are welcomed. For details, please contact the clerks by email.